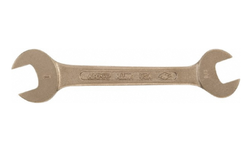 Ampco USA Non-Sparking Double Open End Wrench. Owing to our vast industrial experience in this domain, we are engaged in offering a wide assortment of VDE 1000v Insulated Precision Tweezers Straight. The given product is obtainable on several user-defined specifications. Our proficient personnel makes use of top grade material & ultra-modern techniques to develop our product in accordance with the set parameters. Also, the offered product is well checked by our quality experts to make certain its unmatched quality. We take pleasure to introduce ourselves as one of the renowned manufacturer and supplier of VDE 1000v Insulated Clamp 150mm. These clamps are obtainable from us in numerous customized options as per the market preferences. Offered clamps are developed by our accomplished experts complying industry standard, using the top quality material. The provided clamps are checked on pre-defined parameters so as to offer flawless range. 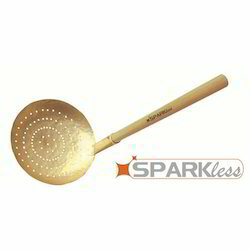 We are leading supplier of Non-Sparking Strainer. Our prestige in the market is largely attributable to our excellently designed U Type Valve Wrench. These valve wrenches are obtainable from us in numerous customized options as per the market preferences. Offered valve wrenches are developed by our accomplished experts complying industry standard, using the top quality material. The provided valve wrenches are checked on pre-defined parameters so as to offer flawless range. 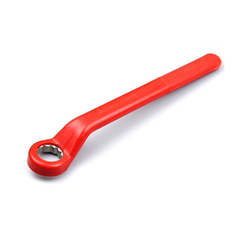 With rich experience and knowledge, we are manufacturing and supplying a qualitative range of Insulated Ring End Wrench for Stripped Bolts. These are manufactured using advanced techniques and high-grade raw material. 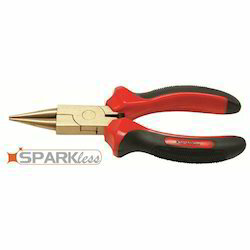 Sparkless ® Non-Sparking Round Nose Plier is most suited for application purposes in potentially explosive environments. Most of our Non-Sparking Tools are forged after casting to achieve better Quality, Performance & Attractive Finish. Available in all Sizes. Established in the year 1983, at Mumbai (Maharashtra, India), we, “Sparkless Non Sparking, Insulated VDE Safety Tools”, are an affluent firm, actively engaged in the manufacturing and supplying the best assortment of VDE 1000V Insulated Safety Tools, VDE 1000V Insulated Safety Tools Part 2 and Non Sparking Tools Safety Tools Anti Sparking. Due to the features like sturdy construction, corrosion resistance, longer service life, less maintenance and high durability, our products are highly demanded among clients all across the nation. The offered products are manufactured at our hi-tech production unit using the superlative grade raw material and sophisticated technology. These are designed in complete compliance with the set international quality standards. Apart from this, these can also be availed by customers in varied customized options as per their variegated demands. We have a well-established sophisticated manufacturing unit and a team of adroit professionals enable us to meet the specific needs of customers. Our production unit is installed with high-end machines that permit us in fabricating products in bulk quantity. Entire product array is tested by our quality inspectors who use appropriate measures during manufacturing which exactly meet with client’s expectations. In addition to this, these tests make sure that we offer only optimum quality and defect free range at clients’ end. Furthermore, our team of highly skilled and qualified personnel works hard with dedication in order to attain the set organizational objectives. An extensive study and research of the market requirements is conducted by our experts and accordingly, our engineers design innovative products that offer a high functionality for various industrial applications. Having in-depth process knowledge in this field, our team works to maximize the demand in the market.